I usually wait for the Target guest designer stuff to go on sale, but this charming blouse had me at hello. I just couldn't pass up its big bow, polka dot print and rich fall colors. 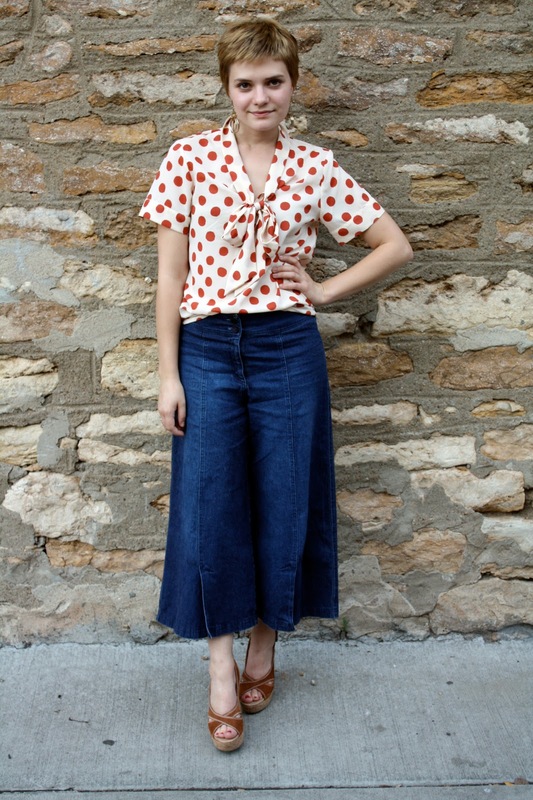 As for the denim culottes, some magazine feature would probably tell me not to wear them because I'm short, but I don't care because I love them! i got this shirt on sunday and i had to have it. i can not wait to pair it with a wool skirt and oxfords. i love it. you look beautiful. I almost bought that blouse-- The Tucker collection is awesome! It looks brilliant on you! Those pants are amazing and that blouse was a good item to spulrge on. Gah! I am out of the country and missed the Tucker release. Hopefully some cute stuff is left in my size upon my return. That blouse is lovely. I'm anxiously awaiting the arrival of this new Target line at a store by me. Love this blouse on you! Favorite print ever! I don't care what the magazines say about the culottes they look amazing on you!!!!! Your whole outfit is just so cool, totally loving that blouse!!! i think you're one of the rare fash bloggers who really does wear what she wants. i love it! looks great - loving the denim! I love that blouse! It's perfect! I have just come across your blog, all the way from the South of Spain,and I love what i see, so I am following you. Do come and see me if you wish. I am ridiculously jealous you actually got one of those blouses. They are no where to be found around here. Cool look, very Italian, actually! Culottes and gauchos are big there!